Abu Dhabi, 21 March 2019: At Etisalat's Annual General Meeting (AGM), held at the company's headquarters in Abu Dhabi, shareholders have backed the board's recommendation to pay full-year 2018 dividends of 80 fils per share and approved the proposal of lifting restrictions on foreign shareholders voting rights. “Etisalat's infrastructure is built to enable digital transformation, to nurture innovation, and to provide superb customer experience, it is a competitive edge that will remain a strategic priority at group level. Our mobile and fixed networks in majority of operating markets are amongst the best within their local markets or surpassed their geographical boundaries and led at global scale. For UAE as an example, Etisalat have the widest LTE coverage globally and among the global leaders when it comes to fiber network penetration. He underlined: “Currently, Etisalat's portfolio spans over 15 countries while serving over 141 million customers. The technology that we provide and enable, brings individuals and societies closer at a local and global level, such firm belief was the drive behind launching our new brand direction “Together Matter” which embodies the power of technology in connecting and enriching people's lives. 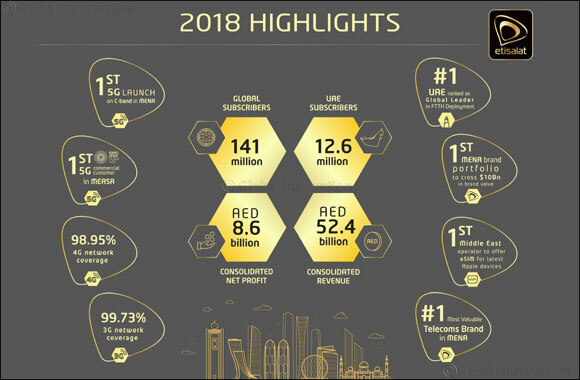 “In 2018 we have delivered a solid financial performance with consolidated revenues at AED 52.4 billion and consolidated net profit at AED 8.6 billion, representing 2.4% YoY growth. An outstanding outcome considering the stagnant global economy and some operating companies' specific challenges pertaining to currency devaluation, geopolitical instability, and elevated competitive and regulatory pressures. “2018 has also witnessed the launch of e-SIM features for Apple watches, in which Etisalat UAE was the first MENA Telecom operator to offer such service. While on a parallel track, we have affirmed our position as the preferred IoT provider with key projects like “Hassantuk”, which is a landmark partnership with UAE's Ministry of Interior to deliver the first Smart Fire Alarm solution in the region.